With the accounting software that is available today, you have the opportunity to set up an automated bookkeeping system. That does not mean that your bookkeeping system will run itself. However, there are some steps you can take to make sure your bookkeeping system is as automated as possible. If you are using QuickBooks to send your invoices, then you should set up QuickBooks Payments. QuickBooks Payments enables your customers to easily pay your invoices via bank ACH or credit card with just a few clicks. Those payments are then downloaded into QuickBooks and the payments automatically applied to the open invoices in question. As long as you only email invoices and you set up QuickBooks Payments in advance, your accounts receivable process will mostly be automated. If you don't use QuickBooks to generate invoices, but instead use some sort of point of sale system, then you need a different method. In this case, you will need to figure out a way to record a daily sales journal entry that mirrors the flow of money into your bank. You should look for a point of sale system that has a seamless integration with QuickBooks. You might also consider a third-party app like Incontrol POS, which can integrate certain POS systems with QuickBooks. 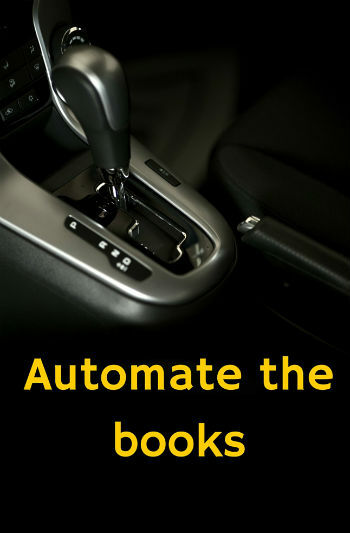 The next step in automating your bookkeeping is to put your accounts payable on autopilot. I recommend setting up your recurring payments on automatic payment to your vendors on your credit card. I prefer vendors who can take credit cards and if they simply can't accept credit cards, I find a different vendor or set those bills up with an automatic bank payment. But I don't like to pay via electronic bank payments as much due to fraud issues and cash flow management. For all day-to-day business expense transactions like gas, food, office supplies, etc., I use a business credit card. You can then link your business credit card to QuickBooks and download those transactions. Using renaming rules will make this process more efficient over time, as QuickBooks gets smarter. You should still review each transaction to ensure accurate accounting coding. But using a credit card allows you to put payment off as long as possible, make one payment, and control your cash flow. The other thing I love about using a credit card is that it allows for a digital bookkeeping system with regard to keeping receipts. All of these accounts payable steps will help make your bookkeeping system more automated. At Salt Lake City Bookkeeping, we are firm believers that every business should outsource their payroll. While we definitely have the skillset to file payroll for our clients, it really just doesn't make sense. The time that it takes to file payroll is much more expensive than just using an outsourced payroll provider. Additionally, when you use a payroll provider, you put the liability of filing taxes on them; meaning, if they file a payroll tax late or incorrectly, it is their problem not yours. When you use an outsourced payroll provider like ADP, your payroll should be fairly simple and automated. ADP's software is very easy to use and it integrates seamlessly with QuickBooks. You also have the options of HR management reducing your time and headaches even further. When I run payroll for our business, the time it takes to enter payroll, review it for accuracy, and get it into QuickBooks accurately is 5 minutes or less per payroll. That is worth every penny. All payroll taxes get paid automatically and all employee checks are deposited automatically to their bank accounts. Employees can even access their own paychecks online, relieving you of yet another managerial duty. The last step in automating your bookkeeping is to set up a set of memorized reports. You should develop a series of reports that give you information on your key business metrics. By following the above system, you should be able to run your key business reports at any time and get information on your important business metrics. You want to utilize QuickBooks memorized reports function so that you always have the exact format you need right at your fingertips. Easy access to good financial reports enables you to make better business decisions. The entire point of automating your bookkeeping system is so that you can focus on what really matters: growing your small business. Unfortunately there is no way to fully automate your bookkeeping system. You still need someone to review the transactions, send the invoices, and make sure that everything is put in the right spot. However, by following these steps, you can make your bookkeeping as automated and efficient as possible. Using an outsourced bookkeeping solution can get you one step closer to full automation of your financial system. You want to make sure you have the right checks and balances in place to make sure there is no fraud or theft. For instance, your bookkeeper should never have the ability to pay bills, sign checks, or move money on your behalf. However, with the right outsourced bookkeeping solution, you can have an automated bookkeeping system that allows you to run critical financial reports whenever you want and make better business decisions. Want to automate your small business bookkeeping?